My older brother is about six years older than me. So when he was in highschool, I was 10-11 years old. Bear with me, I swear this is relevant. When he was in highschool, his class read and watched Rosencrantz and Guildenstern are Dead. Afterwards, he came home and tried to teach me how to play 'verbal tennis'. I lost. Give me a break, I was 10. That being said, several years later, I read/saw it myself and now have fond memories of that particular Tom Stoppard play. Starting 7/30, Bad Habit Productions will be putting on the play - and all of us should go see it. Experience Hamlet from the point of view of two of its minor characters navigating a world of existential angst, frustrated actors, and palace intrigue. In every dark tragedy lies an even darker comedy. PS. I suddenly have the urge to flip a coin 92 times. 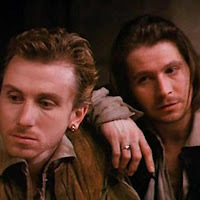 0 Response to "Rosencrantz and Guildenstern are Dead - 7/30"